If you’ve taken many pictures on the iPhone, you’ve undoubtedly dealt with the occasional blurry, dark or unlevel photos. MK HQ wants to help you banish unleveled pictures from your iPhone with Tripod Camera, an app currently available for $2. Keep It Level: The anti-tilt feature in Tripod Camera keeps your photo level with the horizon regardless of how you’re tilting your iPhone. Tripod Camera has all the functions of the iPhone’s built-in camera app, including tap-to-focus for iPhone 3GS owners. The app’s anti-tilt feature will keep your photo level with the horizon regardless of the tilt of your iPhone. This feature is really cool and works great to produce perfectly level shots. 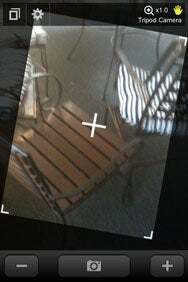 The app’s anti-shake feature helps to prevent blurry pictures by sensing when the camera is still enough to snap a pic automatically. You can also opt to make the entire screen a shutter button, which means that tapping anywhere will snap a picture. You can also enable a ten-second timer that will automatically take a photo ten seconds after you press the shutter button. Oddly enough, though, there’s no way to set a custom time for the timer. Tripod Camera has the ability to digitally zoom in up to 4X. As with any digital zoom, there is some loss of quality, but it’s better than nothing. Once you take your picture, you get a preview of it so you can decide whether or not to save the image. At the time of the preview, you can also apply a flash effect to the photo to brighten things up. This is a nice option for night pictures. Tripod Camera add some nice options to the iPhone’s camera and makes a nice addition to any shutterbug’s tool-set.